Where is my username or password located? 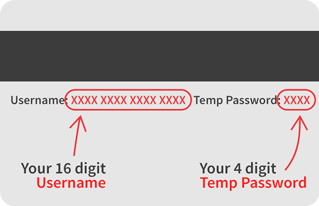 You can lo­cate your tem­po­rary User­name and Pass­word on the back of your Pa­tient Re­wards Hub™ card. Your user­name will be the email ad­dress that you en­tered when you cre­ated your guest Hub ac­count. Your pass­word will be the pass­word that you chose when you cre­ated your guest Hub ac­count.